Coaching, in its simplest form, means to train, tutor or give instruction. It is an excellent skill that can be used to enhance growth and performance, as well as promote individual responsibility and accountability. Iconoclasses Coaching is an ongoing process to endeavour to help build and maintain an effective athlete, coach relationships. Iconoclasses coaching can help identify an athlete’s growth, as well as help plan and develop new skills. Using their skills, we can evaluate and address the developmental needs of the athlete and help them select diverse experiences to gain necessary skills. Coaches and athlete’s can work collaboratively on developing plans that might include training, new programs, life style enrichment, self-study, or work levels and intensities.There are many types of coaching elements that provide a framework of the coaching process. Building Trust – Trust is key to coaching. The coach and athlete’s relationship must have some level of trust for coaching to work. A mutual interest in the success of the other is critical. Trust can begin to develop through open, honest feedback and respect. Defining the Issues – The coach should seek information from the athlete’s to better understand the issue or performance in question. The emphasis is not on proving who is right or wrong, but on gathering information in a non-judgmental manner. Coaching for Success – Taking athlete’s from compliance to commitment can be difficult. Finding or creating that factor means sometimes helping the athlete’s get in touch with what matters to him/her – what are his/her internal goals. Sometimes this is best achieved through the use of open-ended questions leading to the athlete’s self discovery. Creating a Plan of Action – For the purpose of buy-in and commitment, the coach and the athlete’s should jointly create the training/action plan. The plan should include performance goals that are simple, measurable and attainable. Feedback – Feedback is the primary tool used to provide athlete’s with information and guidance. Feedback consists of two-way communication.The athlete’s feedback provides coach’s with clues regarding how they are hindering or aiding their own race and training quality or performance. Prior to Triathlon, I participated in many sports. Endurance Horse Riding for 12 years in Victoria and South Australia. Competing in 40km, 80km, 100km & 160km one day events, and 200km, 240km two day events, also riding the Tom Quilty “Gold Cup” The premium Endurance Riders event (Equivalent in statue as KONA). I was the Treasurer of the South Australian Endurance Horse Riders Association (SAERA) for 2-Years, and active at committee level in Victorian (VERA). Other sports, included Motocross, Endurance Motocross (including the Original BP-HATTA Lakes Rallies), Rugby Union-for Nepean in NSW, Water-Polo and Australian Rules Football at Glenthompson, Victoria, in the Mininera District League. Two years as the “Social Manager & Web Site Manager” of the West Lakes- “Lakers Triathlon Club” in South Australia. A member for some 11 years. From the age of 13 years, I have had a continuous participation of some form of organised sporting activity, along side participation for pure pleasure. At time of writing, I am 65, and my passion has not abated. 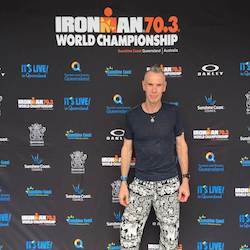 My last International race was in 2018 ITALY IRONMAN - Cervia completing in 7th position in the (65-70 AG). Not as I wished, but acceptable following return of a old neck injury which nearly finished me on the bike, and a long walk home. I was more than happy. (Not all thing go to plan, that you can always count on), the bonus was a totally enjoyable Italian experience and the 3 weeks holiday through Northern Italy. Personally, I regard my biggest long term success, is finishing every race that I have ever entered in my life time in sport. Once entered I have never DNF, if your start something, you finish it .... "Quitting is not and Option!" It’s no secret to those who know me, I love sport, not watching … participation. Triathlon and endurance sport in particular. 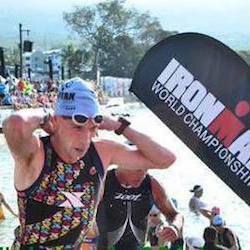 Why do I compete in Triathlon? I guess you could ask me why do I breathe and my answer would be the same. “In a perfect world we would all have a moment. “Where we emerge from the darkness smiling with the light of the world on our face”. Racing Triathlon lets me have that moment a dozen times a year. I define triathlon as, suffering, excitement, disappointing, atmospheric, euphoric and depressive and all important social. In short it’s a “Drug”…. and it’s pure! You make it yourself and become addicted to it. So beware! Triathletes learn to physically manage, socially perform and individually reflect upon endurance sport as a microcosm of the ‘civilising process’, and in fact “LIFE”. My particular conceptualisation “Habitus” is centrally utilised to explain why, at this particular point in the civilising processes, more men and women in factions of the world middle class, quest for ‘exciting significance’ through gruelling endurance sports like triathlon (swim-bike-run competitions or Ultra events). The Pain and suffering narratives are common place amongst participants. Specifically on how triathletes come together as a mutually recognised ‘pain community’ of like-minded actors, and how they learn to relish physical and mental suffering in their chosen sport. Buried in the poetry of the the book “Once a Runner”, Quenton Cassidy discussed the contrast of the average person and the runner; how the average person, in times of greatest danger and fear, knows nothing about how far he could go, whereas the runner explores and pushes this boundary every day. Being a endurance athlete is to be surrounded by people off a like mindset. They say you are the sum of the books you read and the people you surround yourself with. In being around endurance athletes, it has definitely has made me a better person. In mentored people towards completing their first 1/2 marathon, first marathon, 70.3 Ironman & Full Ironman, as well as assisted people towards improving their trail running while often reaching new PB’s along the way. I have personally gained a lot of satisfaction. Myself, I have competed and completed event listed to my memory (after starting Triathlon at age 55 Years (now 64 years at time of writing.) My Enthusiasm has not abated. •	Multiple Olympic (Standard) distance events. •	Multiple Sprint distance events.